As stated in the previous two posts, John Piper distills ten habits of preaching that made Jonathan Edwards an effective preacher of the gospel. He was a powerful instrument in the hand of God as he sought to make God supreme in all of his preaching. By comparison, I am an extremely poor communicator with a relatively immature view of God. However, I would be blessed should God grant that I become even half as faithful in proclaiming the gospel as the late Edwards. For the benefit of others, I have summarized Piper’s analyses in my own words. All true preaching seeks to move the heart for that is where the sinner has turned from God. Piper writes, “Powerful preaching is like surgery. Under the anointing of the Holy Spirit, it locates, lances, and removes the infection of sin.” Since is like a cancerous gangrene eating away the soul of man, and without radical amputation it will destroy every one of us. The Holy Spirit penetrates the hardness of our hearts and removes the heart of stone in order to replace it with a heart of flesh. The Holy Spirit makes us sensitive to the things of God. I heard a preacher once say, “Hard preaching makes soft people.” I think that’s very true. Preaching hard truths in a loving, compelling way softens the hearts of people as the Holy Spirit does the work. Jonathan Edwards was “convinced of the extraordinary deceitfulness of the heart” and how often its sinful appetites blind the mind and force it into complete subjection. Jeremiah 17:9 informs us that the heart is more deceitful than we will ever realize, and that we should not trust it. In fact, we are to trust the Lord rather than our own wisdom or ways. A preacher should be well-acquainted with the deceitfulness of his own heart so that he may properly address the hearts of others. Human beings are so often self-deceived, but the word of God shines a penetrating light upon the true nature of the heart as the Holy Spirit provides the power to change. Preachers should endeavor to make it a life pursuit to study the human heart in light of Scripture in order to more effectively become “surgeons of the soul.” “[Such preaching],” Piper writes, “uncovers the secret things of the heart. And more than once it has led to great awakening in the church.” With the light of Scripture, we must… Probe the heart. Probe the heart. Probe the heart. Edwards delivered a sermon entitled “The Most High, a Prayer-Hearing God.” In a previous post (Edwards on Prayer), I discussed some of Edwards’ thoughts on prayer: “God has been pleased to constitute prayer to be antecedent [coming before] to the bestowment of mercy; and he is please to bestow mercy in consequence of prayer, as though he were prevailed on by prayer.” Essentially, Edwards was saying that God has designed prayer to come before the deliverance of his mercy and it often seems that human prayer has the power to move the heart of God. In reality, God has set his mercy up so that it is released to us through genuine, persevering prayer. He rewards our faith with mercy even though we are entirely helpless and ill-deserving. The preacher, of all people, must be a man of prayer. He must labor diligently and dependently in prayer. His preaching must be under the divine influence if it is to be powerful and effective. Prayer should precede and accompany preaching that aims to move human hearts. The Holy Spirit is the one who fills the heart with holy affections and the heart gives words to the mouth. Edwards said, “When a person is in an holy and lively frame in secret prayer, it will wonderfully supply him with matter and with expressions… [in] preaching.” He further remarked, “Ministers, in order to be burning and shining lights, should walk closely with God, and keep near to Christ… And they should be much in seeking God, and conversing with him by prayer, who is the fountain of light and love.” Prayer, for the Christian and especially the preacher, should be as natural to us as breathing. Edwards described it as “the breath by which the inward burnings of my heart had vent.” Powerful preaching comes from persistent prayer that desperately pleads for the mercy of God to be delivered through the Spirit of power and love. “God is near to the broken-hearted and saves the crushed in spirit” (Psalm 34:18). The greatest knowledge of God comes through brokenness. Brokenness demonstrates a recognition of our own helpless estate before God and our need for His mercy. It shows a complete dependence on Him to lift us up with His tender hands. John Piper writes that “Good preaching comes from a spirit of brokenness and tenderness.” A heart that has been tenderized by the Lord will be able to lead others toward His tender embrace. Jesus had great power and authority, but he was most attractive because he was “gentle and lowly in heart” (Matt. 11:29). His presence was restful for those who were completely restless and burdened with sin. All gracious affections… are brokenhearted affections. A truly Christian love… is a humble, brokenhearted love. The desires of the saints, however earnest, are humble desires: their hope is an humble hope; and their joy, even when it is unspeakable, and full of glory, is a humble, brokenhearted joy, and leaves the Christian more poor in spirit, and more like a little child and more disposed to an universal lowliness of behavior. They felt their infinite responsibility as stewards of the mysteries of God and shepherds appointed by the Chief Shepherd to gather in and watch over souls. They lived and labored and preached like men on whose lips the immortality of thousands hung. Everything they did and spoke bore the stamp of earnestness, and proclaimed to all with whom they came into contact that the matters about which they had been sent to treat were of infinite moment… Their preaching seems to have been of the most masculine and fearless kind, falling on the audience with tremendous power. It was not vehement, it was not fierce, it was not noisy; it was far too solemn to be such; it was massive, weighty, cutting, piercing, sharper than a two-edged sword. The gospel is too powerful and too important to be preached half-heartedly. A man genuinely gripped by such truths will be unable to contain the intense passion that compels him to preach with a blood-earnest desire to see souls saved and made into the image of Christ Jesus. 4. Employ Analogies and Images: Edwards believed that abstract words rarely kindled deep affections. As a result, “Edwards strained to make the glories of heaven irresistibly beautiful and the torments of hell look intolerably horrible.” Sermons that are rich in imagery often leave deep impressions upon the mind, and a lasting warmth to the heart. Not every preacher or teacher is gifted at creative imagery, but Edwards made it a laborious practice to find meaningful analogies. He observed life and nature so thoroughly that he was often able to find images and analogies that served to produce impressions comparable to reality. Most people, especially in our current media generation, struggle to understand abstract theories and need a concrete image to drive reality home to them. An effective teacher or preacher will consider ways to paint an image with words in order to help the hearers grasp God’s truth. 5. Use Threat and Warning: “Edwards did know his hell, but he knew his heaven even better.” When one has a genuine understanding of the glories of heaven and the horrors of hell, there will be a blood-earnest desire to warn those who are apathetic about such realities. “Those who have the largest hearts for heaven shudder most deeply at the horrors of hell.” Jesus was not hesitant to threaten those who were headed for an eternity of destruction (Matthew 5:22; 5:30; 10:28). How can a preacher or teacher remain so silent about a topic that Jesus was so vocal? “Hell awaits every unconverted person. Love must warn them with the threats of the Lord.” The guilt and fear that are stirred up are appropriate when they correspond to the reality of things. There is nothing more loving than to expose the danger awaiting those who are unprepared and to call them to prepare themselves by embracing Christ. Ultimately, the goal is to draw people to the loveliness of Christ. His loveliness will have an enduring attractiveness where “fire insurance” received out of an avoidance of hell will not compel the heart to radical obedience. “Holy love and hope are principles vastly more efficacious upon the heart, to make it tender, and to fill it with a dread of sin… than [is] a slavish fear of hell.” Our purpose as preachers and teachers ought to be “to show the immeasurable riches of [God’s] grace in kindness toward us in Christ Jesus” (Ephesians 2:7). 6. Plead for a response: When confronting people with the realities of heaven and hell, we should call them to examine their heart and respond to the gospel call. This is a decision of the heart, not a physical decision to walk down an aisle during an altar call. Edwards writes, “Sinners… should be earnestly invited to come and accept a Savior, and yield their hearts unto him, with all the winning, encouraging arguments for them… that the Gospel affords.” However, no sinner can come to God except God first draw him near (John 6:44). When the preacher preaches, it is God alone who effects the results for which preachers long. Salvation and life change can come only through the work of the Spirit upon the heart of man. However, that divine necessity does not rule out the preacher or teacher making an eager appel for sinners to respond. God uses means to inspire faith (Rom. 10:17). Edwards writes, “God is the only proper author and fountain; we only are the proper actors… God is said to convert [2 Tim. 2:25], and men are said to convert and turn [Acts 2:38]. God makes a new heart [Ezek. 36:26], and we are commanded to make us a new heart [Ezek. 18:31]. God circumcises the heart [Deut. 30:6], and we are commanded to circumcise our own hearts [Deut. 10:16]… These things are agreeable to that text, ‘God worketh in you both to will and to do. '” Since the Spirit of God works within us for conversion and growth in godliness, the fruit of our salvation is that our lives are increasingly characterized by the fruit of that faith. Piper concludes with, “Good preaching pleads with people to respond to the Word of God.” Man can do nothing more than humbly respond to the Holy Spirit when confronted with the powerful word of God. May the God of all grace give us a courageous spirit of power and love as He uses us to point others to Christ. 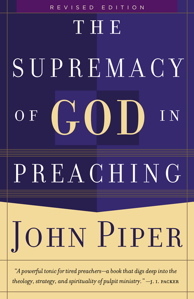 John Piper has written a small, yet helpful book on The Supremacy of God in Preaching. In the book, Piper summarizes several characteristics of Jonathan Edwards’ preaching that serve to make God supreme. I will briefly summarize them, but a greater elaboration of the list is worth the price of the book. God-centered preaching aims to stir up “holy affections”–things like hatred for sin, delight in God, hope in His promises, gratitude for His mercy, desire for holiness, tender compassion toward His people. Edwards suggests that ministers should be catalysts for stirring up affections in their hearers only with those things truly worthy of affection (i.e., the truths of God). By aiming at the affections, preachers are seeking to hit the cause of behavior. People will think, feel, believe, and behave according to what is most important to them. Hence, the importance of stirring up holy affections so that the flame of the Holy Spirit might burn intensely within the heart of every believer. Edwards writes, “Gracious and holy affections have their exercise and fruit in Christian practice.” In short, if the tree is good, the fruit will be good. When God saves us, He gives us heart affections that delight in Him, depend on Him, and seek His glory above our own. Therefore, the best preaching targets the heart for it is the wellspring of life and the fountain from which our words and behaviors overflow. In preaching on John 5:35 about John the Baptist, Edwards emphasized that “a preacher must burn and shine. There must be heat in the heart and light in the mind–and no more heat than justified by the light.” The preacher will be passionate about the truths that he professes, because the Holy Spirit has enlightened his mind to see their significance. The faithful preacher will seek to give his hearers “a good reason” and “just ground” for the affections that he is trying to stir up. He neither manipulates the emotions nor ignores them. Through clear, distinct preaching, a preacher may enlighten the mind through the Holy Spirit’s application of divine truth. The truth gives light and sanctifies the understanding. Therefore, the preacher should exercise both heat and light in his private devotions and public preaching. He should be a “burning and shining light” who aims to impact the head and the heart so that the exercise of passion is actually the exercise of thoughtful passion. Drinking deeply of doctrine will result in an experience of deep delight in the person of God and the nature of His work in human lives. The power of great preaching is found in the word of God and the provision of the Holy Spirit. Piper writes, “Good preaching is ‘saturated with Scripture’ and not ‘based on Scripture. '” It doesn’t just bounce off of the biblical text. Instead it marinates in it, bathes in it, churns in the crucible of its grinding power. Piper writes, “Quote the text! Quote the text! Quote the text!” People need to know where the ideas of the preacher are coming from in Scripture. Edwards writes about Bible passages, “They are as it were the beams of light of the Sun of righteousness; they are the light by which ministers must be enlightened, and the light they are to hold forth to their hearers; and they are the fire whence their hearts and the hearts of their hearers must be enkindled.” I like that word, “enkindled.” It gives me the image of stoking up the fires of the mind by stirring up the smoldering coals that God put there. The fire came from heaven. We just have to stir up the coals by preaching the text clearly and convincingly.